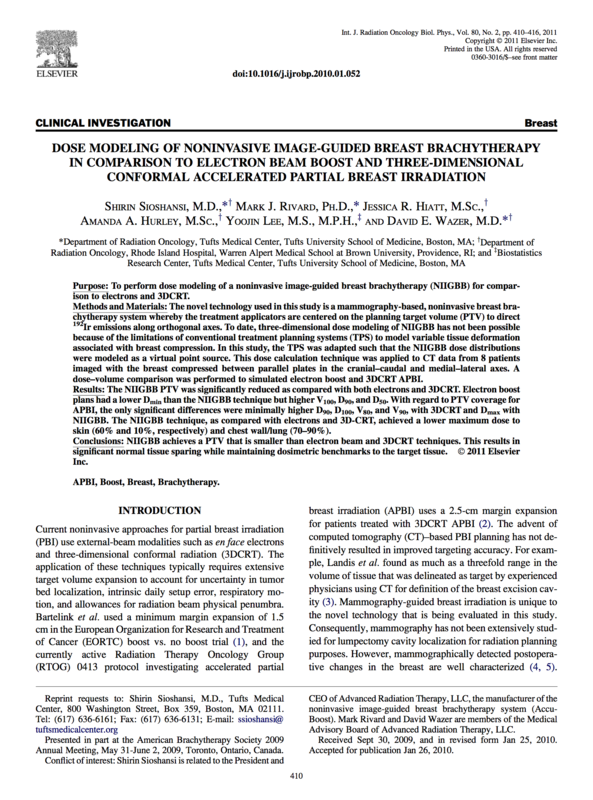 To perform dose modeling of a noninvasive image-guided breast brachytherapy (NIIGBB) for comparison to electrons and 3DCRT. The novel technology used in this study is a mammography-based, noninvasive breast brachytherapy system whereby the treatment applicators are centered on the planning target volume (PTV) to direct 192Ir emissions along orthogonal axes. To date, three-dimensional dose modeling of NIIGBB has not been possible because of the limitations of conventional treatment planning systems (TPS) to model variable tissue deformation associated with breast compression. In this study, the TPS was adapted such that the NIIGBB dose distributions were modeled as a virtual point source. This dose calculation technique was applied to CT data from 8 patients imaged with the breast compressed between parallel plates in the cranial-caudal and medial-lateral axes. A dose–volume comparison was performed to simulated electron boost and 3DCRT APBI.